Welcome address by Hugo Puttaert on day one of Intergrated2013. Yet once you get there (perhaps ignoring the promise of heartburn and soggy, sensory overload) it begins to make sense. 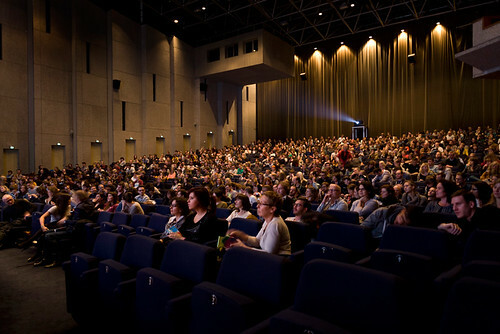 Nearly a thousand delegates, maybe 80 per cent of them students, packed into the impressive Blue Hall at Antwerp’s De Singel and listened – attentively, thoughtfully, critically – to 40-plus speakers in a wide-ranging programme. 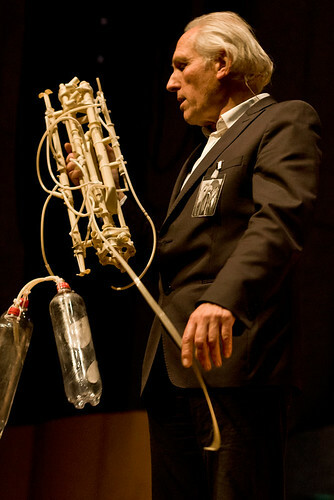 Theo Jansen demonstrates the lemonade bottle-assisted hydraulic system of a Strandbeest. 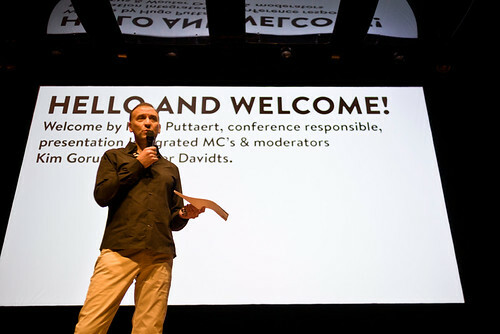 Puttaert departed from graphic design conference conventions in several ways – the inclusion of fine artist Cristo and Strandbeest creator Theo Jansen added an extra dimension. Both were mesmerising speakers, who willed their young audience to ask sparky questions. 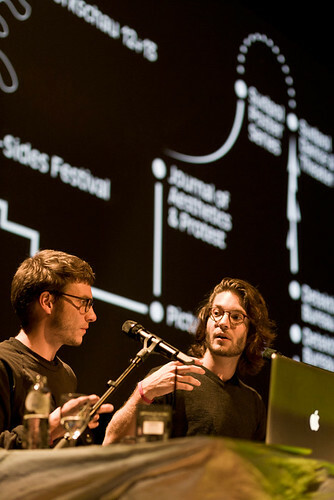 The quickfire sequences of ‘Jonn’ [young] presenters – talks of between twelve and 24 minutes – were unpredictable, sometimes disruptive, adding a welcome energy at times when the conference might have sagged. The proceedings were punctuated by some short, colour-themed ‘in-between movies’ designed by third-year students from Sint Lucas in Antwerp. 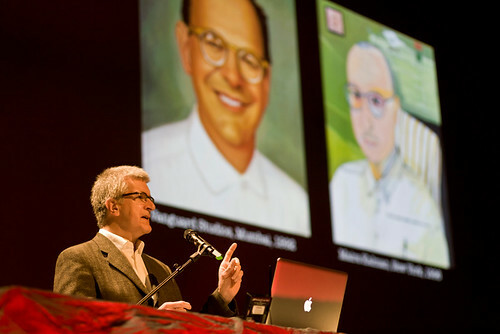 Rick Poynor talking about the late Tibor Kalman (see Reputations in Eye 20). Rick Poynor began the first day with a talk (commissioned by organiser Puttaert) about the late designer Tibor Kalman (1949-89). Early in the lecture, when Poynor asked the young audience whether they had heard of Kalman, very few hands went up. Poynor mapped out the career of Kalman and his studio M&Co from album covers (Talking Heads, Hal Willner’s Lost in the Stars) via Restaurant Florent to his memorable, sometimes subversive promotional gifts. He also took us through Kalman’s startling thirteen-issue run as editor of Colors magazine for Benetton. And we were treated us to some of Kalman’s memorable aphorisms, such as ‘Design doesn’t have to be nice to look at, it just has to work.’ Poynor pointed out that such ideas have entered the design discourse because of characters such as Kalman. 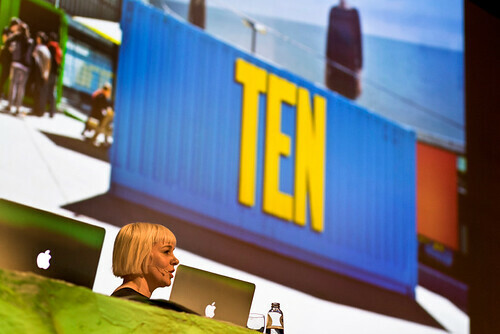 Morag Myerscough speaking about the ‘Power of ten’ summer shows at London College of Communication. See ‘In the thick of it’ in Eye 79. 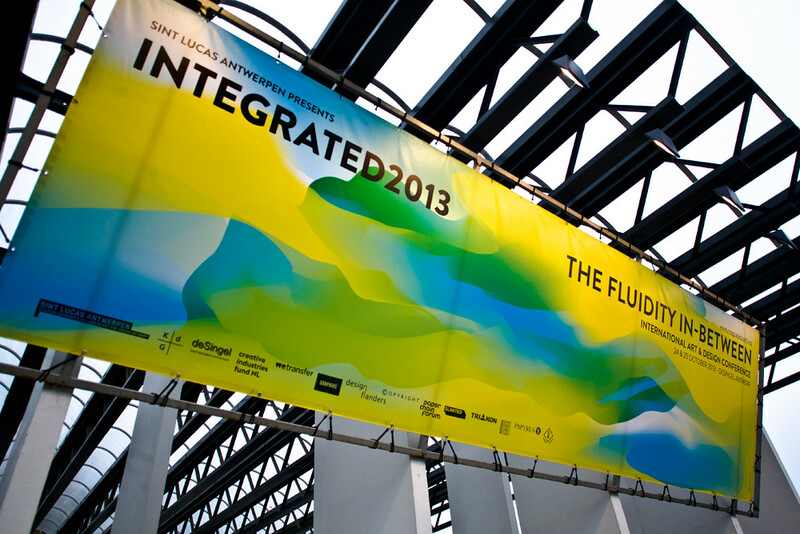 Even the more conventional ‘show and tell’ presentations at Integrated2013 were given an editorial twist. Sara De Bondt, calling her talk ‘Occasional Presentations’, focused her attention on her publishing imprint Occasional Papers, while Morag Myerscough talked about her design for physical spaces such as schools, cafes, arts venues and health centres, many of which required direct involvement with the actual people who used these places. Another example of Myerscough’s environmental design was in the news just a few days later when adverse weather blew her giant beach ball called I Get Around (a public art installation) into the road by the Old Street Roundabout. Felix and Mathis Pfäffli concentrated on posters, presenting a multiplicity of startling designs that showed what they called ‘post-digital materiality’. 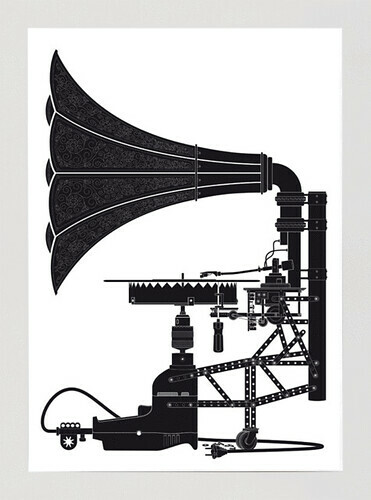 For one of his posters for the ‘B-sides Festival’, Felix drew a diagram for a record player that would destroy the contents of the A-side while playing the B-side (below). In due course, someone actually constructed such a machine. 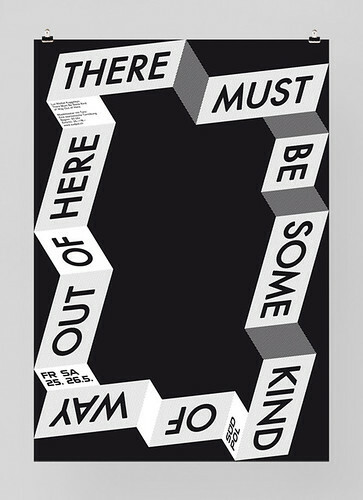 Felix also explained the ‘three layers of process’ he used to design posters: subjective, objective and graphical, and showed how this informed the design for ‘There must be some kind of way our of here’ (below). Theo Jansen was the hit of the day with his eccentric Strandbeests – creatures made largely from exoskeletons of yellow electrical insulation tubes, powered by the wind and made to live out a life of poetic movement on the beach near Scheveningen, Holland. A compilation video showing Theo Jansen’s Strandbeests.